Persistence Market Research, in its recent study on the micronized wax market, offers a detailed value-volume analysis of the micronized wax market on the basis of various segments such as product type, application, and region. In terms of product type, the synthetic wax segment is projected to be a lucrative segment in terms of growth opportunities, and is mostly being used for inks and coating applications in the global micronized wax market. There has been significant growth in the demand for micronized wax across various application such as printing inks, paints and coatings, adhesives, and plastic processing, among others. This factor is expected to lay a strong base for the robust growth of the global micronized wax market in the coming years. The micronized wax market report covers market analysis through basis point analysis (BPS), incremental dollar opportunity index, market attractiveness analysis, and Y-o-Y growth. The volume analysis for the micronized wax market has been considered in 'tons', covering data for the historical period 2013–2017 and forecast for 2018–2028, with 2017 as the base year. The micronized wax market report begins with an executive summary covering a gist of the report. The executive summary highlights the global micronized wax market overview in terms of value and volume through various segments. The section also covers key supply- and demand-side trends in the global micronized wax market. 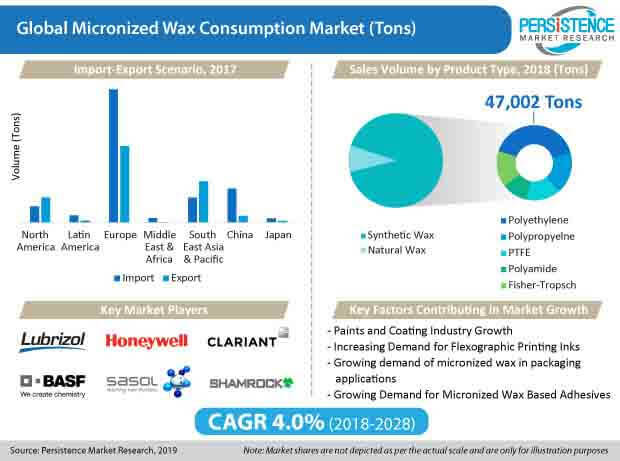 This section also outlines a technology roadmap with the introduction, adoption, and current developments in the micronized wax market. The next section of the micronized wax market report begins with market definition, market taxonomy, and research scope of the micronized wax market. The next section that follows in the global micronized wax market report includes the macroeconomic factors, along with the value chain analysis, drivers, restraints, trends, and opportunities having a profound rate of influence on the growth of the micronized wax market. The information has been backed up with suitable examples and facts as obtained from official and authentic data credentials in the micronized wax market. The next section provides a pricing analysis of micronized wax on the basis of regional fronts, wherein, the weighted average price has been computed to arrive at the global average prices. The primary objective of the micronized wax market report is to offer key insights on competition positioning, current trends, market potential, growth rates, and other relevant statistics. In the final section of the micronized wax market report, we have provided a competition analysis with market share analysis pertaining to the micronized wax market, and the performance of manufacturers by a tier-down structure of the global micronized wax market. In the competition dashboard section of the global micronized wax market report, we have provided a dashboard view of major players, along with their market shares and key business strategies. This would enable clients to evaluate the strategies deployed by market leaders, and consequently help them develop effective strategies in the micronized wax market. The first stage of micronized wax research entailed the formulation of a preliminary hypothesis, which was considered from primary as well as secondary approaches. To analyse the micronized wax market share and competition analysis, we tracked the key developments in the micronized wax market, such as collaborations, expansion, mergers & acquisitions, new orders, product launches, awards, and recognition for the companies operating in the market. Competition benchmarking has been provided for the top 5 competitors with respect to sales performance of micronized wax. Micronized wax market size in 2017 was US$ 601.4 Mn. The micronized wax market is expected to observe a moderate growth rate of 4.0% over 2018-2028. 3. The industrial wax market was around ~US$ 12.8 Bn in 2017, with the global market being dominated by fossil-based (petroleum) market with around 85% share. Global petroleum wax was valued at US$ 9.8 billion in 2017. Foodstuff packaging held a prominent share in the global petroleum market, followed by the pharmaceutical industry. North America and Europe account for more than 50% of the global petroleum wax demand. Petroleum-based products are gaining more prominence compared to the other types, mostly due to their large production scales compared to natural waxes. The global micronized wax market accounted for a share of around 6-8% in the overall fossil-based market in 2017. North America, Europe, and China represent significant growth opportunities. At the same time, more developed regions are experiencing substantial business and demographic modifications that will transform value chains in the segment. Europe is projected to hold a relatively prominent share in the global micronized wax market. The requirement for micronized wax across various applications such as plastic processing, inks and coatings, and adhesives among others. This is anticipated to lay a strong base for the robust growth of the global micronized wax market. In terms of growth opportunities in the micronized wax market, Europe, North America, and China, are expected to generate high demand for micronized wax. By product type, the synthetic wax segment is projected to be a very lucrative segment in the micronized wax market, with a value share of over 90%, as registered in 2018. The growing demand for micronized wax for packaging and building material applications is projected to boost the growth of the synthetic micronized wax market in the coming years. Fast-growing economies such as China, India, Brazil, South Africa, and GCC countries have witnessed a rise in the demand for paints and coatings, due to the rapid industrial and infrastructural development across these countries. Government are also investing to improve their country’s infrastructure, and this is a major factor driving the demand for paints and coatings. Micronized wax is an important constituent for the manufactures of resins, and is used to produce high surface finish paints and coatings. These factors are expected to drive the growth of the global micronized wax market during the forecast period. Over the past few years, there has been an increase in the number of acquisition and expansion activities in the petroleum refinery market across the globe. This can be significantly attributed to the efforts being made by companies to meet the rising demand for micronized wax, and gain high-growth across various regions. Also, strategic developments among end users such as candle producers will boost the demand for micro waxes. According to the National Candle Association (NCA), the United States represents a massive demand for candles, including candle accessories by U.S households. These key developments always act as trends for the global micronized wax market. The micronized wax market is primarily driven by its demand from paints and coatings, packaging, adhesive applications, and building material. Demand growth is expected to be driven by the growth of end-use applications. Micronized waxes have tacky quality, rarely characterized in terms of boiling range, very non-volatile, and have auto-flammability properties. Manufacturers have been developing products that meet a diverse and demanding set of requirements. For instance, they have been using micronized waxes for the formulation of inks and coatings to adjust hardness or softness, and the solidification point of a product. The demand for micronized wax for the packaging of foodstuff is expected to witness high growth in the near future. Moreover, increasing applications in the food packaging industry and pharmaceutical products sector are also expected to further help demand growth. The global micronized wax market is a fragmented market, wherein, tier 1 companies hold around than 44-45% revenue share. Top companies in the micronized wax market include BASF SE, The Lubrizol Corporation, Clariant AG, and Honeywell International Inc., among others. As a part of their business strategy, prominent micronized wax players have been focusing on gaining market share in North America and Europe, as these two regions account for prominent shares in terms of the demand for adhesives, and inks & coatings, and thus, are witnessing a rise in the demand for micronized wax. Some of the micronized wax market players have also showing keen interest on expanding their geographical presence in the Middle East & Africa and Asia Pacific regions, with increasing production facilities, transportation, and energy infrastructure, which is expected to create lucrative growth opportunities for micronized wax manufacturers. As a differentiating strategy, micronized wax market participants are focusing on cost reduction in their product offerings, and the development of new techniques used for micronized wax.